"Comet ISON (C/2012 S1) is currently in the constellation Gemini, moving between the heads of the twins Castor and Pollux," says Chumack. "It is still pretty faint, near 16th magnitude, but don't be fooled by that. This could become one of the best comets in many years." Comet ISON is a sungrazer. On Nov. 28, 2013, it will fly through the sun's outer atmosphere only 1.2 million km from the stellar surface below. If the comet survives the encounter, it could emerge glowing as brightly as the Moon, visible near the sun in the blue daylight sky. The comet's dusty tail stretching into the night would create a worldwide sensation. Comet ISON looks so puny now because it is so far away, currently near the orbit of Jupiter. As it falls toward the sun in the months ahead it will warm up and reveal more about its true character. By the summer of 2013, researchers should know whether optimistic predictions about Comet ISON are justified. The Ultraviolet/Optical Telescope aboard NASA's Swift imaged comet ISON (center) on Jan. 30, when it was located about 3.3 degrees from the bright star Castor in the constellation Gemini. At the time of this 5.5-minute optical exposure, ISON was about 5,000 times fainter than the limit of human vision. Image released March 29, 2013. A NASA spacecraft scanning for the most powerful explosions in the universe has captured a photo of Comet ISON, an icy wanderer that could potentially dazzle stargazers when it swings close to the sun later this year. 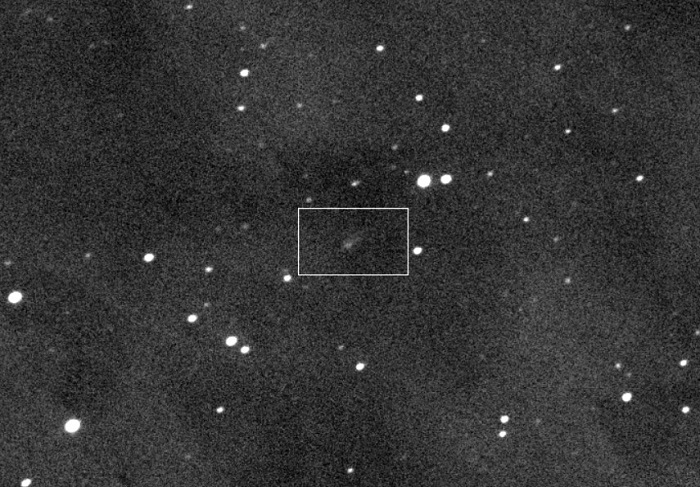 NASA's Swift satellite, which is typically used to track intense gamma-ray bursts from distant stars, photographed Comet ISON on Jan. 30, with the space agency unveiling the photo today (March 29). By tracking the comet over the last two months, Swift has allowed astronomers to learn new details about how large the comet is and how fast it is spewing out gas and dust. 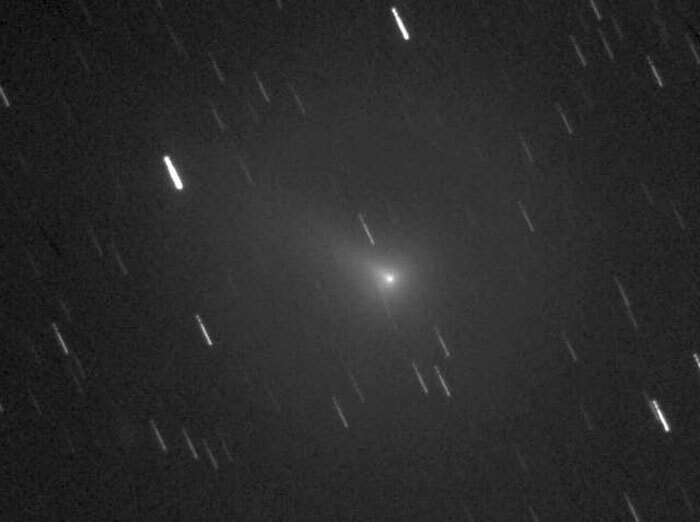 "Comet ISON has the potential to be among the brightest comets of the last 50 years, which gives us a rare opportunity to observe its changes in great detail and over an extended period," said Lead Investigator Dennis Bodewits, an astronomer with University of Maryland at College Park (UMCP) who helped obtain the new image. "Comet ISON has the potential to be among the brightest comets of the last 50 years, which gives us a rare opportunity to observe its changes in great detail and over an extended period," said Lead Investigator Dennis Bodewits, an astronomer at UMCP.Additional factors, including an encounter with Mars followed by a scorching close approach to the sun, make comet ISON an object of special interest. In late February, at NASA's request, a team of comet experts initiated the Comet ISON Observing Campaign (CIOC) to assist ground- and space-based facilities in obtaining the most scientifically useful data. Typically, a comet's water content remains frozen until it comes within about three times Earth's distance to the sun. While Swift's UVOT cannot detect water directly, the molecule quickly breaks into hydrogen atoms and hydroxyl (OH) molecules when exposed to ultraviolet sunlight. The UVOT detects light emitted by hydroxyl and other important molecular fragments as well as sunlight reflected from dust.The Jan. 30 UVOT observations reveal that ISON was shedding about 112,000 pounds (51,000 kg) of dust, or about two-thirds the mass of an unfueled space shuttle, every minute. By contrast, the comet was producing only about 130 pounds (60 kg) of water every minute, or about four times the amount flowing out of a residential sprinkler system. When NASA's Swift spacecraft observed the comet in January 2013, it was still near the orbit of Jupiter, but already very active. More than 112,000 pounds of dust were spewing from the comet's nucleus every minute. It turns out, some of that dust might end up on Earth. n a new ScienceCast video, experts discuss what might happen if Comet ISON peppers Earth's atmosphere with dust. Veteran meteor researcher Paul Wiegert of the University of Western Ontario has been using a computer to model the trajectory of dust ejected by Comet ISON, and his findings suggest that an unusual meteor shower could be in the offing. "For several days around January 12, 2014, Earth will pass through a stream of fine-grained debris from Comet ISON," says Wiegert. "The resulting shower could have some interesting properties. According to Wiegert's computer models, the debris stream is populated with extremely tiny grains of dust, no more than a few microns wide, pushed toward Earth by the gentle radiation pressure of the sun. They will be hitting at a speed of 56 km/s or 125,000 mph. Because the particles are so small, Earth’s upper atmosphere will rapidly slow them to a stop. "Instead of burning up in a flash of light, they will drift gently down to the Earth below," he says. Don’t expect to notice. The invisible rain of comet dust, if it occurs, would be very slow. It can take months or even years for fine dust to settle out of the high atmosphere. While the dust is “up there,” it could produce noctilucent clouds (NLCs). NLCs are icy clouds that glow electric-blue as they float more than 80 km above Earth's poles. Recent data from NASA's AIM spacecraft suggests that NLCs are seeded by space dust. Tiny meteoroids act as nucleating points where water molecules gather; the resulting ice crystals assemble into clouds at the edge of space itself. 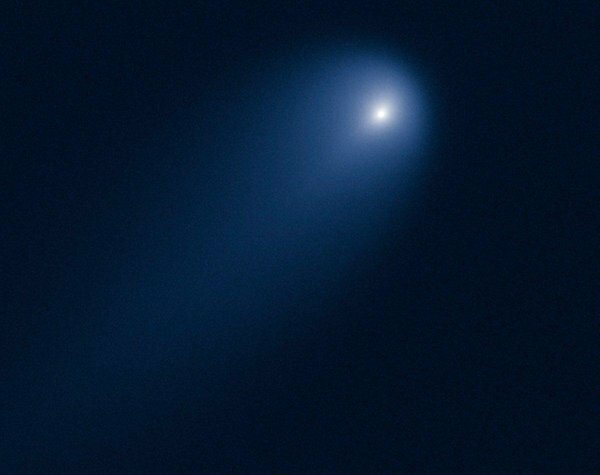 This is still speculative, but Comet ISON could provide the seeds for a noctilucent display. Electric-blue ripples over Earth's polar regions might be the only visible sign that a shower is underway. Wiegert notes another curiosity: "The shower is going to hit our planet from two directions at once." When Earth passes through the debris stream, we will encounter two populations of comet dust. One swarm of dust will be following the Comet ISON into the sun. Another swarm will be moving in the opposite direction, pushed away from the sun by solar radiation pressure. The streams will pepper opposite sides of Earth simultaneously. "In my experience, this kind of double whammy is unprecedented," says Wiegert. Bill Cooke, lead scientist at NASA's Meteoroid Environment Office, says there's little danger to Earth-orbiting spacecraft. "These particles are just too small to penetrate the walls of our satellites, and they don't stand a chance against the heavy shielding of the ISS." However, he adds, mission operators will be alert around January 12th for possible anomalies. Sky watchers should probably be alert, too. 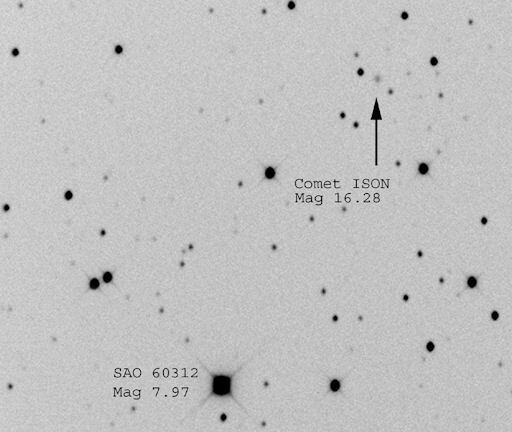 The odds of seeing anything are low, but Comet ISON could prove full of surprises. 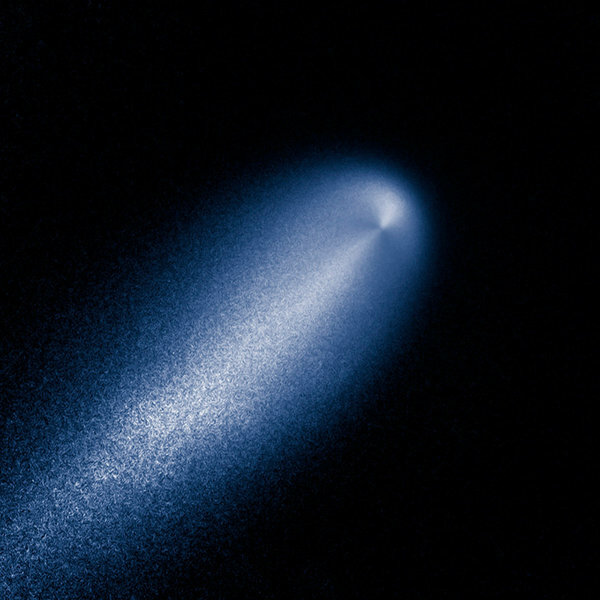 Comet C/2012 S1 (ISON) takes on a fuzzy glow in an April 10 image from the Hubble Space Telescope. The blue tint has been added to the black-and-white imagery. 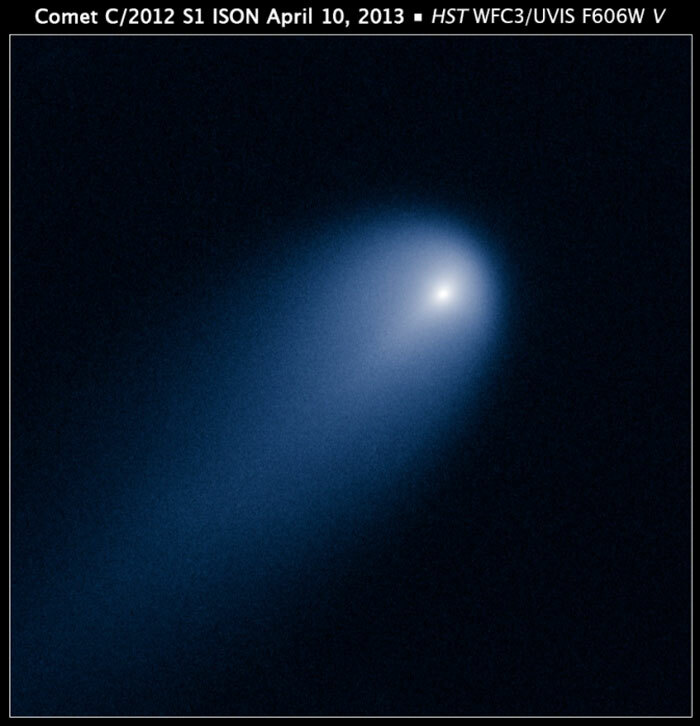 Comet ISON, the long-traveling iceball that skywatchers hope will turn into the "Comet of the Century," takes on a fuzzy glow in an image captured two weeks ago by the Hubble Space Telescope and unveiled on Tuesday. The picture was taken on April 10, using Hubble's Wide Field Camera 3, when the comet was 386 million miles (621 million kilometers) from the sun and 394 million miles (634 million kilometers) from Earth. That's just inside the orbit of Jupiter. Right now, the comet's brightness is roughly magnitude-16, which means it can only be seen with telescopes. But comet-watchers are hoping that ISON will get dramatically brighter as it swings around the sun in late November. Some have said the comet could match the brightness of Venus or even the full moon. The reason for those hopes — and the reason for all the "coulds" and "mights" — is that ISON appears to be a long-period comet, coming in from the far reaches of the solar system for the first time in living memory. Such comets are unpredictable: Will they shed lots of dust and glowing gas, or will they turn out to be duds? ISON's orbit is due to bring it within 700,000 miles (1.2 million kilometers) of the sun's surface. That could cause ISON to crumble like Comet Elenin did in 2011, or it could spark a flare-up of Comet Lovejoy proportions. The picture from Hubble helps astronomers get a better fix on the current state of Comet ISON: The nucleus appears to be no larger than three or four miles (five to seven kilometers) across. In Tuesday's image release, the Hubble team says that's "remarkably small, considering the high level of activity observed in the comet so far." The comet's fuzzy head, known as the coma, measures about 3,100 miles (5,000 kilometers) across, or a little less than the distance from New York to Dublin. ISON's tail extends more than 57,000 miles, far beyond Hubble's field of view. Detailed readings from Hubble could unlock the secrets of ISON's origins, University of Maryland astronomer Michael A'Hearn said in a news release. "We want to look for the ratio of the three dominant ices, water, frozen carbon monoxide, and frozen carbon dioxide, or dry ice," A'Hearn said. "That can tell us the temperature at which the comet formed, and with that temperature, we can then say where in the solar system it formed." Comet ISON was discovered last September and is formally known as C/2012 S1 (ISON). It takes its name from the International Scientific Optical Network, a group of observatories in 10 countries managed by Russia's Keldysh Institute of Applied Mathematics. This contrast-enhanced image was produced from Hubble's view of Comet ISON to reveal the subtle structure in the inner coma of the comet. Such enhancements help astronomers determine the comet's shape and evolution, plus the spin of its solid nucleus. 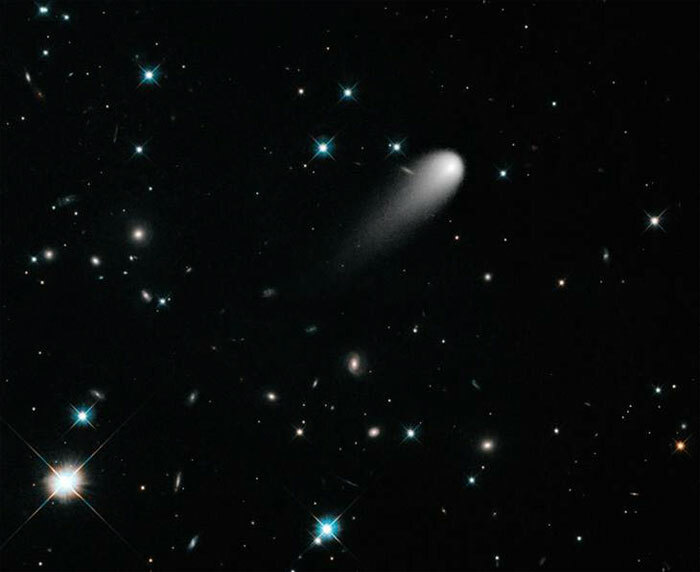 Will ISON Be 'Comet of the Century' or a Celestial Flop? As astronomers track a possible "comet of the century" in the coming months, they might need to recall an old adage: "Those who cannot remember the past are condemned to repeat it." When it was first sighted last September by two Russian amateur astronomers, Comet ISON was located some 620 million miles (1 billion kilometers) from the sun. At the time, it was hovering at around 18th magnitude on the brightness scale — about 100,000 times fainter than the faintest star visible to the unaided eye. While that is extremely faint, ISON was still glowing rather brightly for a comet so far from the sun. When it was determined that the comet would eventually "graze" the sun, coming within 730,000 miles (1.2 million kilometers) of the solar surface on Nov. 28, 2013, the implication was that ISON would become superbright — possibly matching the brilliance of a full moon. 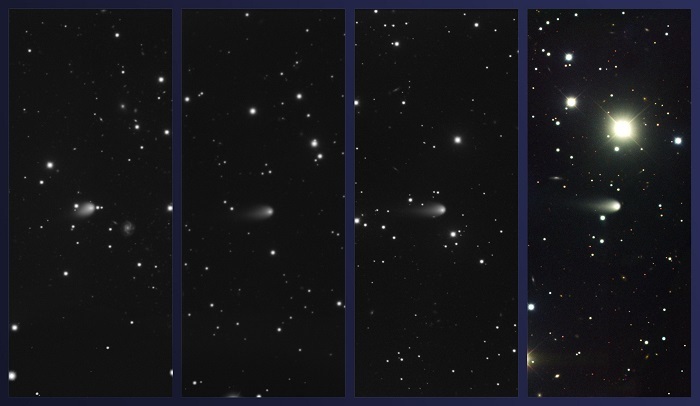 Images of Comet ISON obtained using the Gemini Multi-Object Spectrograph at Gemini North on February 4, March 4, April 3, and May 4, 2013 (left to right, respectively; Comet ISON at center in all images). A new series of images from Gemini Observatory shows Comet C/2012 S1 (ISON) racing toward an uncomfortably close rendezvous with the Sun. In late November the comet could present a stunning sight in the twilight sky and remain easily visible, or even brilliant, into early December of this year. The time-sequence images, spanning early February through May 2013, show the comet’s remarkable activity despite its current great distance from the Sun and Earth. The information gleaned from the series provides vital clues as to the comet’s overall behavior and potential to present a spectacular show. However, it's anyone’s guess if the comet has the “right stuff” to survive its extremely close brush with the Sun at the end of November and become an early morning spectacle from Earth in early December 2013. The images show the comet sporting a well-defined parabolic hood in the sunward direction that tapers into a short and stubby tail pointing away from the Sun. These features form when dust and gas escape from the comet’s icy nucleus and surround that main body to form a relatively extensive atmosphere called a coma. Solar wind and radiation pressure push the coma’s material away from the Sun to form the comet’s tail, which we see here at a slight angle (thus its stubby appearance). Discovered in September 2012 by two Russian amateur astronomers, Comet ISON is likely making its first passage into the inner Solar System from what is called the Oort Cloud, a region deep in the recesses of our Solar System, where comets and icy bodies dwell. Historically, comets making a first go-around the Sun exhibit strong activity as they near the inner Solar System, but they often fizzle as they get closer to the Sun. Astronomer Karen Meech, at the University of Hawaii’s Institute for Astronomy (IfA) in Honolulu, is currently working on preliminary analysis of the new Gemini data (as well as other observations from around the world) and notes that the comet’s activity has been decreasing somewhat over the past month. “Early analysis of our models shows that ISON’s brightness through April can be reproduced by outgassing from either carbon monoxide or carbon dioxide. The current decrease may be because this comet is coming close to the Sun for the first time, and a “volatile frosting” of ice may be coming off revealing a less active layer beneath. It is just now getting close enough to the Sun where water will erupt from the nucleus revealing ISON’s inner secrets,” says Meech. NASA’s Swift satellite and the Hubble Space Telescope (HST) have also imaged Comet ISON recently in this region of space. Swift’s ultraviolet observations determined that the comet’s main body was spewing some 850 tons of dust per second at the beginning of the year, leading astronomers to estimate the comet’s nucleus diameter is some 3-4 miles (5-6 kilometers). HST scientists concurred with that size estimate, adding that the comet’s coma measures about 3100 miles (5000 km) across. The comet gets brighter as the outgassing increases and pushes more dust from the surface of the comet. Scientists are using the comet’s brightness, along with information about the size of the nucleus and measurements of the production of gas and dust, to understand the composition of the ices that control the activity. Most comets brighten significantly and develop a noticeable tail at about the distance of the asteroid belt (about 3 times the Earth-Sun distance –– between the orbits of Mars and Jupiter) because this is when the warming rays of the Sun can convert the water ice inside the comet into a gas. This comet was bright and active outside the orbit of Jupiter — when it was twice as far from the Sun. This meant that some gas other than water was controlling the activity. On November 28, 2013, Comet ISON will make one of the closest passes ever recorded as a comet grazes the Sun, penetrating our star’s million-degree outer atmosphere, called the corona, and moving to within 800,000 miles (1.3 million km) of the Sun’s surface. Shortly before that critical passage, the comet may appear bright enough for expert observers using proper care to see it close to the Sun in daylight. What happens after that no one knows for sure. But if Comet ISON survives that close encounter, the comet may appear in our morning sky before dawn in early December and become one of the greatest comets in the last 50 years or more. Even if the comet completely disintegrates, skywatchers shouldn’t lose hope. When Comet C/2011 W3 (Lovejoy) plunged into the Sun’s corona in December 2011, its nucleus totally disintegrated into tiny bits of ice and dust, yet it still put on a glorious show after that event. Regardless of whether Comet ISON becomes the “Comet of the Century,” as some speculate, it will likely be a nice naked-eye and/or binocular wonder from both the Northern and Southern Hemispheres in the weeks leading up to its close approach with the Sun. By late October, the comet should be visible through binoculars as a fuzzy glow in the eastern sky before sunrise, in the far southeastern part of the constellation of Leo. By early November, the comet should be a much finer binocular object. It will steadily brighten as it drifts ever faster, night by night, through southern Virgo, passing close to the bright star Spica. It is during the last half of the month that observations will be most important, as the comet edges into Libra and the dawn, where it will brighten to naked-eye visibility and perhaps sport an obvious tail. The comet reaches perihelion (the closest point in its orbit to the Sun) on November 28th, when it will also attain its maximum brightness, and perhaps be visible in the daytime. If Comet ISON survives perihelion, it will swing around the Sun and appear as both an early morning and early evening object from the Northern Hemisphere. The situation is less favorable from the Southern Hemisphere, as the comet will set before the Sun in the evening and rise with the Sun in the morning. By December 10th, and given that everything goes well, Comet ISON may be a fine spectacle in the early morning sky as viewed from the Northern Hemisphere. Under dark skies, it may sport a long tail stretching straight up from the eastern horizon, from the constellations of Ophiuchus to Ursa Major. The comet will also be visible in the evening sky during this time but with its tail appearing angled and closer to the horizon. Scientists around the world have been tracking the promising Comet ISON because of its potential to star in a spectacular celestial show later this year, but from now through Aug. 8 the comet is on a "summer sabbatical." Comet ISON — which some have hailed as the next "comet of the century" — is currently located too near the sun to be seen from Earth. Since June 22, the comet has been less than 18 degrees from the sun and therefore cannot be seen against a dark sky. Your closed fist held at arm's length covers about 10 degrees of the sky. Currently located against the stars of the zodiacal constellation of Gemini, or the twins, the comet is progressing slowly eastward and will cross over into the boundaries of Cancer, the crab, on Aug. 1. A week later, on Aug. 8, the comet will have moved out as far as 18 degrees from the sun and once again will be evident against a dark sky. The Hubble Space Telescope's science team has put Comet ISON's fireworks into motion as a preview for what many hope will become the "comet of the century" five months from now. The time-lapse movie shows a sequence of observations captured by Hubble's Wide Field Camera 3 over the course of 43 minutes on May 8, when ISON was 403 million miles (650 million kilometers) from Earth, between the orbits of Jupiter and Mars. During that time, the comet traveled 34,000 miles in its course toward the sun. The video condenses 43 minutes' worth of motion into a repeated 5-second clip. The Hubble Heritage Team released the imagery to celebrate the Fourth of July, but in reality, these fireworks are ice-cold: The tail is a stream of gas and dust escaping from Comet ISON's nucleus. The next month or so is a good time for ISON-watchers to take a vacation and enjoy the Fourth's fireworks, because the comet's position in the sky is too close to the sun to make for good viewing. Although it's too dim to be seen with the naked eye, astronomers are hoping that the comet will be significantly brighter when it's observable again in August. There's a lot of uncertainty surrounding ISON's fate — in part because it's thought to be coming into the inner solar system for the first time from the Oort Cloud, the huge reservoir of cometary material that lies hundreds of billions of miles away. What's more, ISON's orbital track is due to bring it only 685,000 miles (1.1 million kilometers) away from the sun in late November, which means it qualifies as a "sungrazer." The comet, which was discovered just last year, could break up and fizzle out during its solar encounter, like Comet Elenin did in 2011. But if ISON survives, it could brighten into a real beaut, like another sungrazer called Comet Lovejoy. "Comet ISON is still very far away, and thus it remains difficult to predict exactly how bright the comet will become in November. However, there does exist the potential for this to be one of the brightest comets of the past century," the NASA Comet ISON Observing Campaign, or CIOC, says on its brand-new website, ISONCampaign.org. Even if ISON doesn't live up to skywatchers' high expectations, astronomers around the world will be keeping close watch — and sharing their insights via ISONCampaign.org. "The existence of this website and the CIOC does not mean that we will get a 'Comet of the Century,' or even a moderately bright comet," campaign organizer Karl Battams writes. "The purpose of this whole CIOC exercise is that there exists the possibility of obtaining some unprecedented science, and we are not going to sit idly by simply because we have no promises of what we'll learn." A comet’s journey through the solar system is perilous and violent. A giant ejection of solar material from the sun could rip its tail off. Before it reaches Mars -- at some 230 million miles away from the sun -- the radiation of the sun begins to boil its water, the first step toward breaking apart. And, if it survives all this, the intense radiation and pressure as it flies near the surface of the sun could destroy it altogether. Right now, Comet ISON is making that journey. It began its trip from the Oort cloud region of our solar system and is now travelling toward the sun. The comet will reach its closest approach to the sun on Thanksgiving Day -- Nov. 28, 2013 -- skimming just 730,000 miles above the sun’s surface. If it comes around the sun without breaking up, the comet will be visible in the Northern Hemisphere with the naked eye, and from what we see now, ISON is predicted to be a particularly bright and beautiful comet. Cataloged as C/2012 S1, Comet ISON was first spotted 585 million miles away in September 2012. This is its very first trip around the sun, which means it is still made of pristine matter from the earliest days of the solar system’s formation, its top layers never having been lost by a trip near the sun. Scientists will point as many ground-based observatories as they can and at least 15 space-based assets towards the comet along the way, in order to learn more about this time capsule from when the solar system first formed. Even if the comet does not survive, tracking its journey will help scientists understand what the comet is made of, how it reacts to its environment, and what this explains about the origins of the solar system. Closer to the sun, watching how the comet and its tail interact with the vast solar atmosphere can teach scientists more about the sun itself. Predicted hour-by-hour position of Comet ISON in various instruments on one of NASA’s Solar Terrestrial Relations Observatory spacecraft between 1 a.m. EST on Nov. 26, 2013, and 7 p.m. EST on Nov. 29, 2013. The blue field of view is from the outer coronagraph and green from the inner coronagraph. NASA has initiated a Comet ISON Observing Campaign to facilitate a massive global observation campaign incorporating both space-based and ground-based telescopes and encouraging citizen scientists and both professional and amateur astronomers to participate. 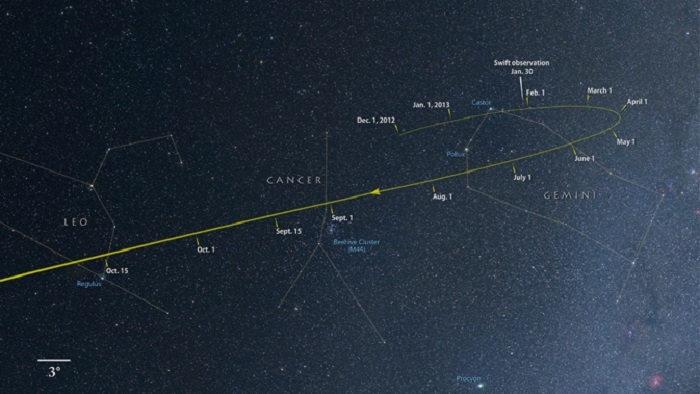 Read on for a timeline of observations expected of Comet ISON on its perilous journey. 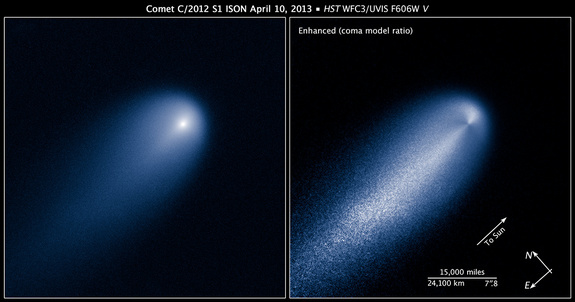 Hubble's view of Comet ISON (C/2012 S1) on April 10, 2013. This image was taken in visible light. The blue false color was added to bring out details in the comet structure. The comet began its journey from the Oort cloud, a swath of icy objects that orbit far beyond Neptune. This is Comet ISON’s first trip through the inner solar system. Comet ISON was first discovered by Russian astronomers, Vitali Nevski and Artyom Novichonok, using the International Scientific Optical Network in Kislovodsk, Russia. NASA’s Deep Impact acquired images of Comet ISON. The observations were unable to detect whether carbon monoxide or carbon dioxide was present. For two months, NASA’s Swift mission observed ISON when it was around 460 million miles away from the sun. (http://1.usa.gov/13E3yg0) Observations showed that ISON was shedding about 112,000 pounds of dust and 130 pounds of water every minute. The lower amount of water represents the fact that the comet was too far away from the sun for its water ice to have begun evaporating. Instead, other materials such as carbon dioxide or carbon monoxide ice were boiling off. NASA's Spitzer Space Telescope observed Comet ISON at 310 million miles away from the Sun. The data are still being processed and no results have been announced yet. Sometime in late July or early August, the comet will pass what’s called the frost line, some 230 to 280 million miles away from the sun, when it will feel enough radiation from the sun that water will begin to evaporate and the comet will appear brighter. Some comets have broken up upon crossing the frost line. Beginning in August, astronomers will be able to observe the comet through ground-based telescopes once again. From early June through late-August, ISON was almost directly behind the sun as viewed from Earth, and thus could not be observed from the ground. In September, the comet will be visible near dawn in the Southern Hemisphere with binoculars. Launch window for the Balloon Rapid Response for ISON, or BRRISON. This balloon, which with its payload will be 671 feet tall, taller than the Washington Monument, will launch from NASA’s Scientific Balloon Flight Facility in Fort Sumner, N.M. for a single day, carrying a 2.6-foot telescope and other science equipment. It will soar up to 23 miles above Earth’s surface, where it can observe the comet largely unhindered by Earth’s atmosphere. 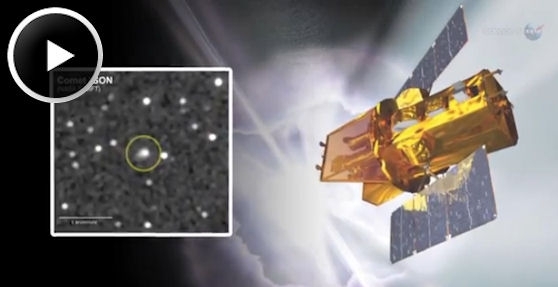 BRRISON will observe ISON in the near-infrared, near-ultraviolet and visible wavelength ranges, and will measure the ratio of carbon dioxide to water emissions from the comet. This ratio will be a vital diagnostic of the comet’s origins. These emissions are blocked by Earth’s atmosphere and cannot be measured from the ground. BRRISON is an unprecedented quick-reaction project to take advantage of the opportunity presented by the discovery of comet ISON, and is the first NASA Planetary Science Division balloon mission to observe a comet. Mars Curiosity and Opportunity will have a view of ISON in October, with Oct. 1, 2013, being the comet’s closest approach to Mars. Comet ISON will be close enough to the sun, as of Oct. 10 that it will be visible by an instrument with an extremely wide view on one of the solar observatories: the HI 2 instrument on one of NASA’s Solar Terrestrial Relations Observatories, STEREO-A. At that point the comet will be around 94.5 million miles away from the sun. Additional Hubble observations are planned to provide new estimates on nucleus size and composition as well as to search for any fragments that have broken off. Comet ISON will be visible to MESSENGER, which is near Mercury. The closest approach will be on Nov. 19. Once the comet passes Mercury, it will be on the most perilous part of its journey. The intense radiation of the sun causes material to evaporate quickly off the comet. Moreover the very pressure of the solar particles on the comet can cause it to break up. A slew of space and ground-based telescopes will watch the comet as it makes its slingshot around the sun. Launch window for NASA’s FORTIS (short for Far-ultraviolet Off Rowland-Circle for Imaging and Spectroscopy) sounding rocket, which will measure ultraviolet light from Comet ISON as it nears the sun. Such light can help scientists determine the production rate of volatile chemicals leaving the comet surface and also can be used to search for previously undetected types of atoms or molecules on the comet. As of Nov. 21, Comet ISON will begin to enter the fields of view of NASA’s space-based solar observatories. Comet ISON will be viewed first in what’s called coronagraphs, images that block the brighter view of the sun itself in order to focus on the solar atmosphere, the corona. Such images – from STEREO and the joint European Space Agency/NASA Solar Heliospheric Observatory, or SOHO -- will likely be quite visually compelling. NASA’s Solar Dynamics Observatory, or SDO, will view the comet for a few hours around perihelion. SDO’s imagery should be detailed enough to gather information about how the comet evolves through the radiation and pressure of the sun’s atmosphere. All of these observatories will have different views. 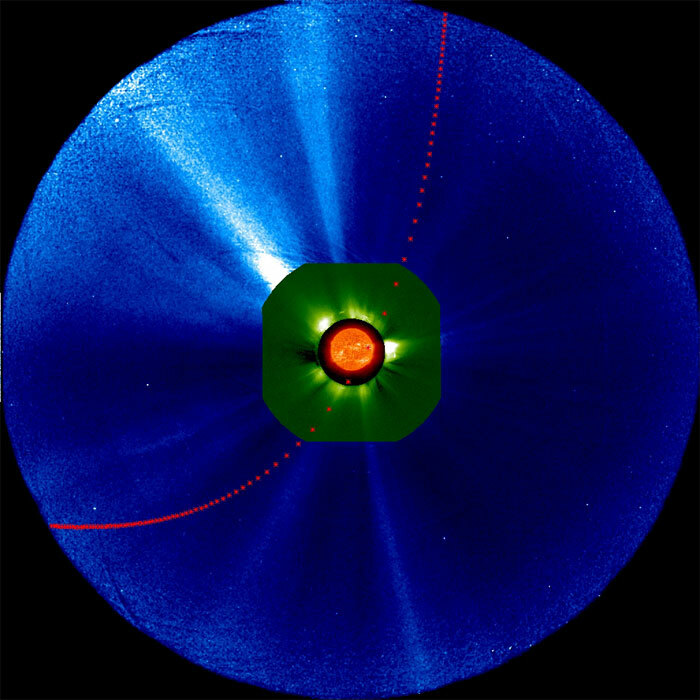 STEREO-A will be the only one that sees the comet transit across the face of the sun. In SDO’s view, the comet will appear to travel above the sun. In addition, ground-based solar telescopes – observing in optical, infrared and radio wavelengths – will all be able to observe the comet during perihelion. Such observations will provide additional information about the composition of the comet and how material evaporates off it, fueling the dusty cloud that surrounds the nucleus. One last solar effect could impact the comet at this stage in its journey. If the sun coincidentally sends out a giant cloud of solar particles, known as a coronal mass ejection, at the right time and direction to pass the comet, it could pull the comet’s tail right off. If Comet ISON survives its trip around the sun, there’s a good chance that it will be incredibly bright and easily visible with the naked eye in the Northern Hemisphere. In early December, it will be seen in the morning, low on the horizon to the east-southeast. In late December and early January, it will be visible all night long. Closest approach to Earth, just a third of the distance between Earth and the sun, at approximately 2.8 million miles away. Comet ISON, the fuzzy snowball that skywatchers hope will become the "comet of the century" in November, shines in a colorful setting provided by the Hubble Space Telescope and its science team. The actual comet is out of view until next month, due to its current position in relation to the sun. However, the Hubble picture shows ISON as it looked on April 30, against a background of stars and galaxies. This image is an exclusive from the Hubble team's ISON Blog, which will deliver images and lore about the comet as its approaches the sun. ISON was discovered last September by astronomers using the International Scientific Optical Network's 16-inch (0.4-meter) Santel reflecting telescope in Russia. It's expected to come within 685,000 miles (1.1 million kilometers) of the sun in late November. If ISON survives that encounter, it could brighten into a comet more brilliant than 2011's Comet Lovejoy. And unlike Lovejoy, it would be visible in the Northern Hemisphere. That's why there's been such a hubbub over just how bright ISON could get. Hubble's experts will add to the hubbub on Wednesday when they present a Google+ Hangout about ISON at 4 p.m. ET. The host for the event is Tony Darnell, an astronomer at the Space Telescope Science Institute. Fellow astronomers Alberto Conti and Scott Lewis will join Darnell to talk about comets in general and ISON in particular. Max Mutchler, Bonnie Meinke and Jian-Yang Li will discuss what Hubble is expected to see, while Zolt Levay will focus on the space telescope's ISON imagery. The world's most loved space telescope, plus the comet of the century? That sounds like a match made in the heavens. Images captured June 13 with Spitzer's Infrared Array Camera indicate carbon dioxide is slowly and steadily "fizzing" away from the so-called "soda-pop comet," along with dust, in a tail about 186,400 miles long. "We estimate ISON is emitting about 2.2 million pounds of what is most likely carbon dioxide gas and about 120 million pounds of dust every day," said Carey Lisse, leader of NASA's Comet ISON Observation Campaign and a senior research scientist at the Johns Hopkins University Applied Physics Laboratory in Laurel, Md. "Previous observations made by NASA's Hubble Space Telescope and the Swift Gamma-Ray Burst Mission and Deep Impact spacecraft gave us only upper limits for any gas emission from ISON. Thanks to Spitzer, we now know for sure the comet's distant activity has been powered by gas." Comet ISON was about 312 million miles from the sun, 3.35 times farther than Earth, when the observations were made. "These fabulous observations of ISON are unique and set the stage for more observations and discoveries to follow as part of a comprehensive NASA campaign to observe the comet," said James L. Green, NASA's director of planetary science in Washington. "ISON is very exciting. 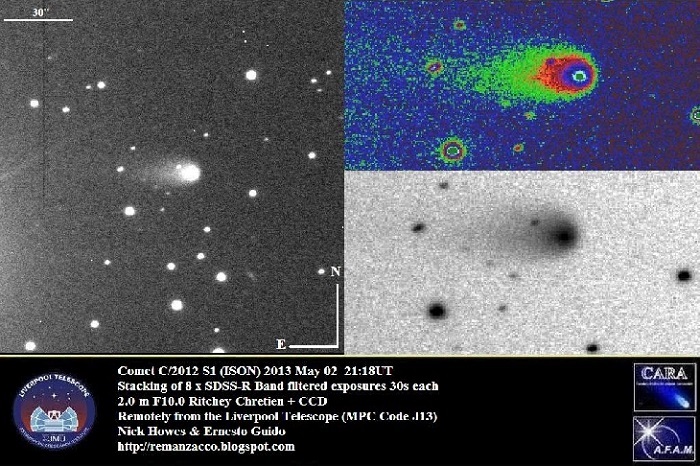 We believe that data collected from this comet can help explain how and when the solar system first formed." Comet ISON (officially known as C/2012 S1) is less than 3 miles in diameter, about the size of a small mountain, and weighs between 7 billion and 7 trillion pounds. Because the comet is still very far away, its true size and density have not been determined accurately. Like all comets, ISON is a dirty snowball made up of dust and frozen gases such as water, ammonia, methane and carbon dioxide. These are some of the fundamental building blocks which, scientists believe, led to the formation of the planets 4.5 billion years ago. Comet ISON is believed to be inbound on its first passage from the distant Oort Cloud, a roughly spherical collection of comets and comet-like structures that exists in a space between one-tenth light-year and 1 light-year from the sun. The comet will pass within 724,000 miles of the sun on Nov. 28. It is warming up gradually as it gets closer to the sun. In the process, different gases are heating up to the point of evaporation, revealing themselves to instruments in space and on the ground. Carbon dioxide is thought to be the gas that powers emission for most comets between the orbits of Saturn and the asteroids. The comet was discovered Sept. 21, roughly between Jupiter and Saturn, by Vitali Nevski and Artyom Novichonok at the International Scientific Optical Network (ISON) near Kislovodsk, Russia. This counts as an early detection of a comet, and the strong carbon dioxide emissions may have made the detection possible. "This observation gives us a good picture of part of the composition of ISON, and, by extension, of the proto-planetary disk from which the planets were formed," said Lisse. "Much of the carbon in the comet appears to be locked up in carbon dioxide ice. We will know even more in late July and August, when the comet begins to warm up near the water-ice line outside of the orbit of Mars, and we can detect the most abundant frozen gas, which is water, as it boils away from the comet." NASA's Jet Propulsion Laboratory (JPL) in Pasadena, Calif., manages the Spitzer Space Telescope mission for NASA's Science Mission Directorate in Washington. Science operations are conducted at the Spitzer Science Center at the California Institute of Technology (Caltech) in Pasadena. Data are archived at the Infrared Science Archive housed at the Infrared Processing and Analysis Center at Caltech. Caltech manages JPL for NASA. Astronomer Ignacio Ferrin, FACom researcher, has determined the fate of comet C/2012 S1 ISON, described by some as "the comet of the century". The comet has fizzled completely. It is probable that it may disintegrate at or before reaching perihelion. 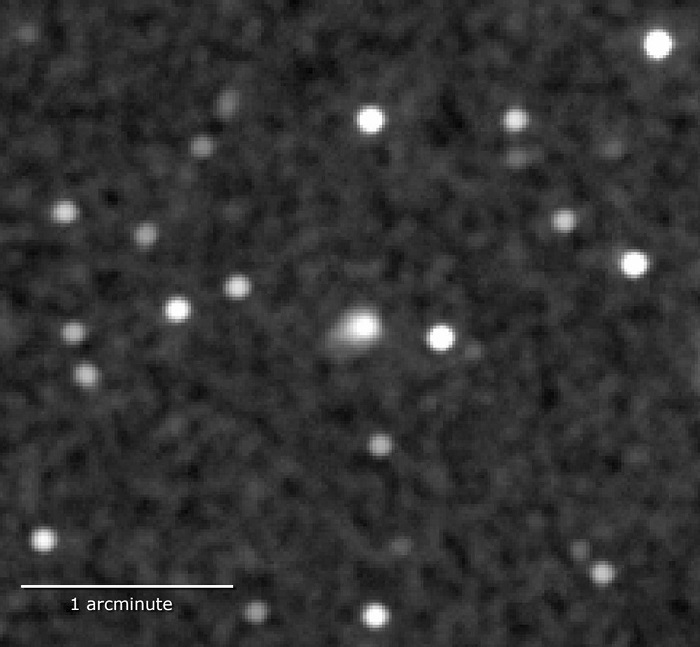 Image of the comet C/2002 O4 Hönig that after 2002 suffered a similar fate to that expecting comet ISON. Even if the comet survives this scenario it will have to surpass other difficulties. The comet will reach perihelion very near the Sun, where the astronomers have calculated a temperature of 2700 degrees celsius, sufficient to melt iron and lead. Besides this trial by fire, the comet will penetrate Roche’s Limit. Any object that penetrates this forbidden limit will experience solar gravitational forces that may tear apart the nucleus of the comet. The combination of temperature, radiation and tidal forces below the Roche’s Limit, may prove too much for the comet, who may not survive the encounter with the Sun. There is a brief window of observation between October 7th and November 4th, when the comet will be more than 50 degrees from the Sun. The scientist add that even so the observational conditions will be difficult to determine what was the fate of the comet. “The future of comet ISON does not look bright”, Dr. Ferrin conclude. 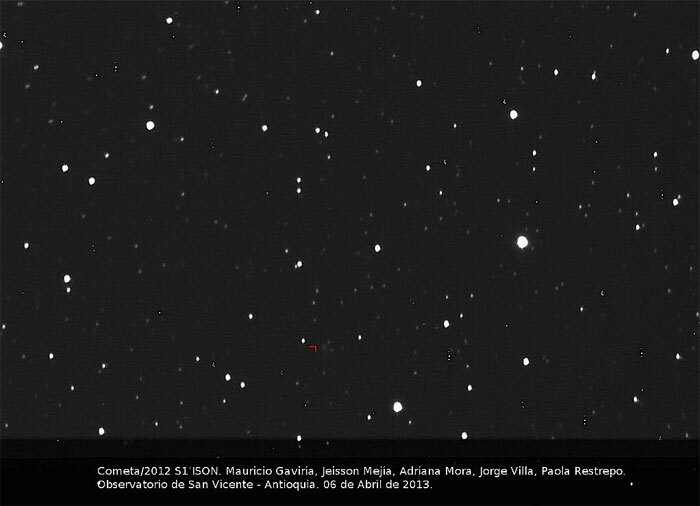 Picture of the comet taken by Astronomy Undergraduate Students at the Observatory San Vicente La Loma (Antioquia, Colombia). The camera was loaded onto the International Space Station (ISS) last Sunday, with an aim towards capturing footage of the comet C/2012 S, otherwise known as ISON. The comet, discovered in September of 2012, will pass close to Earth in December and, with its status as a “sungrazer,” is expected to emit great quantities of dust and gas on its first approach to the sun. According to NASA, if the comet survives its journey to the sun, it could appear to glow as bright as the moon and be visible in broad daylight. This marks the first time that a 4K camera has been brought onboard the ISS. NHK and JAXA have collaborated on previous space shoots on board the space station, including 2006′s first HDTV broadcast from the site, and the use of a ultra-high sensitivity camera system in 2011 to capture meteor showers and auroras for the international copro Cosmic Shore. Bruce Gary's recovery image of Comet ISON (C2012 S1), taken on the morning of August 12th. The comet looks hardly better than it did last spring. Since June, Comet ISON has been hidden behind the Sun. Now an amateur imager has just recovered it low in the dawn — and it hasn't been brightening as much as we hoped. Don't bet on a great naked-eye spectacle this December. A couple weeks earlier than we expected, amateur imager Bruce Gary in Arizona has become the first person to pick up Comet ISON again after its 2½-month intermission behind the glare of the Sun. Using an 11-inch scope pointing only 6° above the eastern dawn horizon, and by stacking images, he succeeded in recording a fuzzy point with an anti-sunward tail at Comet ISON's exact predicted position among stars that are as faint as magnitude 16. Measuring the image, Gary comes up with a total V magnitude of 14.3 ± 0.2 for the comet that is being so widely anticipated worldwide. That's about 2 magnitudes fainter than the comet "should" be, compared to the formula that first led astronomers to predict it would become a grand naked-eye sight before dawn in early December. It's no improvement on the 2-magnitude deficit the comet was showing when astronomers last had good looks at it around the end of May. Here is Gary's detailed and thorough report and analysis of his observation. There too (at the bottom) are three new light-curve predictions for the coming months, based on three model formulas. The short version: the comet could still turn out to be fairly good, or it might never reach naked-eye visibility at all. ISON is currently about at the distance from the Sun where water ice sublimation would be expected to be taking over in the comet's photometric development. That the comet continues to appear as faint as it does implies that its intrinsic brightness (absolute magnitude) is low and that the nucleus is probably small and relatively inactive. Past performances by dynamically "new" comets [newcomers to the inner solar system], as ISON has turned out to be, have typically been pretty lackluster. With very few exceptions, these comets brighten only very slowly [as they approach, after appearing promising when farther out]. In the lightcurve prediction graph presented by Scarmato, Morales and Gary, their green line corresponds to typical "new" comet behavior. Note that this suggests the comet's brightness barely ever breaks the naked-eye barrier, even at perihelion! Further, if one accepts anything like the green line's absolute magnitude of +9.73 for the comet, then ISON has no chance of surviving its perihelion, based on my paper "Post-Perihelion Survival of Comets with Small q" (International Comet Quarterly, Vol. 13, No. 3, July 1991). So... things are looking ever more bleak for chances of any grand display to be put on by ISON come this December. Still, I wouldn't fully commit to such until I see some actual visual observations reported. Many other observers will be looking and imaging on coming mornings as the comet moves higher into less difficult view. Watch for more news updates. Update Aug. 13: A disagreement has emerged on discussion lists about whether Gary's measurement of magnitude 14.3 refers to the comet's total magnitude or just its nucleus. Gary tells us, "My photometry aperture circle has a diameter of 28 arcseconds, so I think this would include the entire coma and part of the tail." In other words, practically all of the comet's light. He goes into full detail about this here. Around the world, astronomers are buzzing with anticipation over the approach of Comet ISON. On Thanksgiving Day 2013, the icy visitor from the outer solar system will skim the sun's outer atmosphere and, if it survives, could emerge as one of the brightest comets in years. First, though, it has to fly by Mars. "Comet ISON is paying a visit to the Red Planet," says astronomer Carey Lisse of the Johns Hopkins University Applied Physics Lab. "On Oct 1st, the comet will pass within 0.07 AU from Mars, about six times closer than it will ever come to Earth." Mars rovers and satellites will get a close-up view. It’s too early to say whether Curiosity will be able to see the comet from the surface of Mars—that depends on how much ISON brightens between now and then. Lisse says the best bet is NASA’s Mars Reconnaissance Orbiter. The MRO satellite is equipped with a powerful half-meter telescope named HiRISE that is more than capable of detecting the comet’s atmosphere and tail. Observations are planned on four dates: August 20th, Sept 29th, and Oct 1st and 2nd. HiRISE wasn't sent to Mars to do astronomy, notes the telescope’s principal investigator Alfred McEwen of the University of Arizona. "The camera is designed for rapid imaging of Mars. Our maximum exposure time is limited compared to detectors on other space telescopes. This is a major limitation for imaging comets. Nevertheless, I think we will detect Comet ISON." 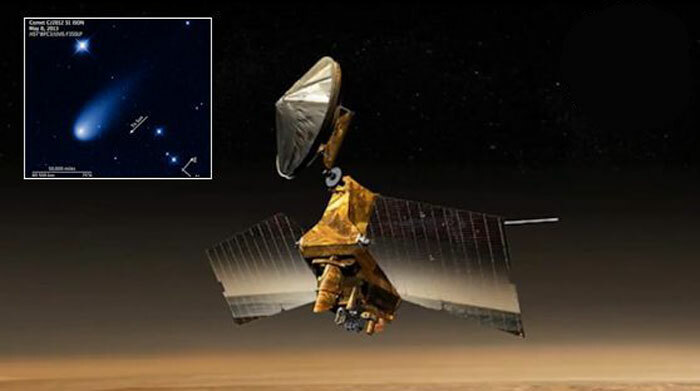 The Mars flyby comes at a key time in Comet ISON’s journey. It will have just crossed the "frost line," a place just outside the orbit of Mars where solar heating is enough to start vaporizing frozen water.